Hurricane Wilma slammed into Mexico's Mayan Riviera, where thousands of stranded tourists hunkered down Friday in hotel ballrooms and shelters pounded by torrential rains and shrieking winds as the streets of Cancun filled with water. The fearsome Category 4 storm, which killed 13 people in Haiti and Jamaica, was expected to pummel the tip of the Yucatan Peninsula for two days, sparking fears of catastrophic damage. 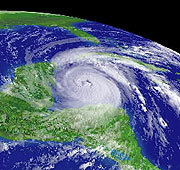 It is then expected to sideswipe Cuba before bearing down on Florida, where it's expected to hit land at midday Monday. Waves of up to 6.4 metres crashed on the extreme westernmost tip of Cuba and heavy rains cut off several small communities. About 7,000 residents were evacuated from the coastal fishing village La Coloma in Cuba's southern Pinar del Rio province. In Florida, emergency officials issued evacuation orders yesterday for the western coastal town Naples and a nearby island, which the storm was expected to reach Monday. Florida Keys residents also were asked to leave. The Category 4 hurricane had earlier been expected to strike somewhere on Florida's west coast this weekend. Its erratic movement frustrated residents already worried about what would be the eighth hurricane to hit or pass near the state since August 2004. Wilma will likely linger over the Yucatan for a few days, which should weaken the hurricane's top sustained winds to 130 mph or lower. “That would obviously be terrible news for Mexico, but for the US interests it means that we’ll have a weaker hurricane coming out into the Gulf of Mexico and it will be slower in getting here,” said Max Mayfield, director of the National Hurricane Centre in Miami.